Alphonse Areola |Bastia (on loan from PSG) | France | 21 | Goalkeeper: Bastia played Rennes over the weekend where Areola featured in the 2-0 victory for the home side. The youngster had an excellent game from the start and was troubled only thrice in goal, making all three saves; this highlighting sound concentration throughout the game. Areola had a 100% aerial duel stat coming from that game. 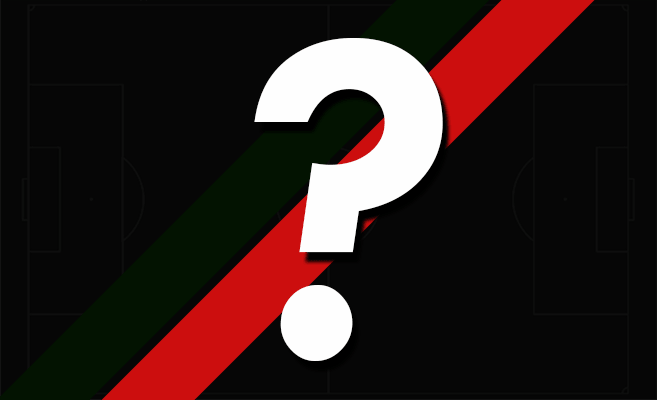 A game changing moment that appeared in the 81st minute involved the young lad as he came off his line to punch the ball away from his goal under pressure from opposition strikers after a ball from deep in midfield that hurled into a dangerous position in the 18 yard box. This punch lead to a swift counter for Bastia who took the most of the opportunity and slotted the second goal, sealing the game. Hector Bellerin | Arsenal | Spain | 19 | Right back: The former Barcelona youngster put in a good performance over the weekend as Arsenal beat Newcastle 4-1 on home soil. Analysing the Magpies’ crosses during the game, a significantly large number coming in from Arsenal’s left flank were unsuccessful, pinning it down to the Spaniard marshalling that area of the park with 7 significant blocks. Offensively, Bellerin looked bright and in the 57th minute, he got high up the pitch, beyond the Newcastle leftback and zipped in a pinpoint cross for Olivier Giroud to score Arsenal’s third goal of the game. Bellerin ended the 90 minutes with 75% tackling and 8 clearances, 6 of which were in or on the edge of the box. This was the teenagers’ first Talent Radar Team of the Week appearance. John Anthony Brooks | Hertha BSC | United States| 21 | Centre Back: The American youngster was at the heart of the defence as the side from Berlin got a valuable 1-0 victory over struggling Dortmund. Managing a clean sheet against a side desperate for a win, throwing in all their attackers was no small feat, helped certainly by the defence. Brooks made a convincing 5 tackles and 4 interceptions as Dortmund struggle to click or find lapses in a solid defensive showing from the home side. There was cover provided well from midfield, but facing the likes of Ciro Immobile, ex-player Adrian Ramos along with the pacy Pierre-Emerick Aubameyang, Brooks and Hertha did an excellent job. Samuel Umtiti | Lyon | France | 21 | Centre Back: Umtiti featured in Lyon’s 3-0 home victory over Caen this weekend. the Frenchman put in a solid performance which produced a clean sheet for the home side. A second half corner fell to the head of the youngster who’s flick on lead to Lyon’s second goal, which put the game past Caen. Umtiti got an assist for that one. 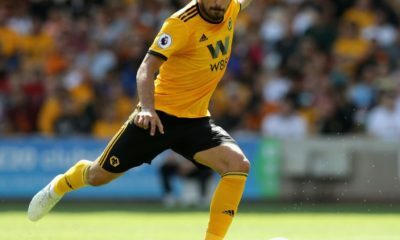 His vision from deep in the field was brought to light with a key pass in the 74th minute from within his own half, reaching the edge of the box. Two blocked shots, four clearances and one interception statistically cleared a good performance on the night. Jetro Willems | PSV Eindhoven | Holland | 21 | Left Back: PSV were looking to keep their position at the top of the Eridivisie table and they performed exactly that with a 2-0 home win again FC Twente. Jetro Willems put in yet another sound performance for the leaders, defensively and offensively. Defensively, the cleansheet speaks for itself but Willems had quite the game going forward. 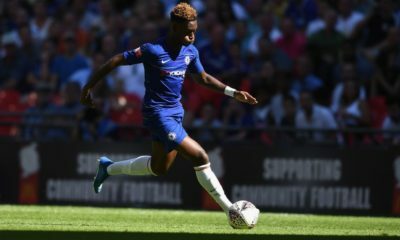 The youngster had 4 shots, three of which were on target; the shots coming in as early as the 3rd minute and as late as the 86th minute, a shout out of his consistency through out the 90 minutes. A Willem’s corner saw PSV open their account on the night with a delicious ball to the far post, knocked in by Luuk de Jong. The game saw 4 more chances created by the Dutchman and a total of 10 crosses on the night. Johannes Geis | 1. FSV Mainz 05 | Germany | 21 |Defensive Midfielder: Mainz’ winless run continued to seven games as they drew Stuttgart 1-1 at home. Though, the home side were unlucky to have not picked up all 3 points against a Stuttgart side lacking in nearly every area of play. 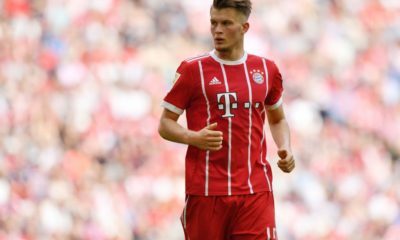 Young Geis was the most impressive in midfield, continuing his development as he grows into a quality defensive midfield option. He scored the sides only goal for the night with a superb free-kick that perfectly flew into the net. Though the youngster did seem slow on occasion in his positioning which could have been punished by a more threatening attacking midfielder. 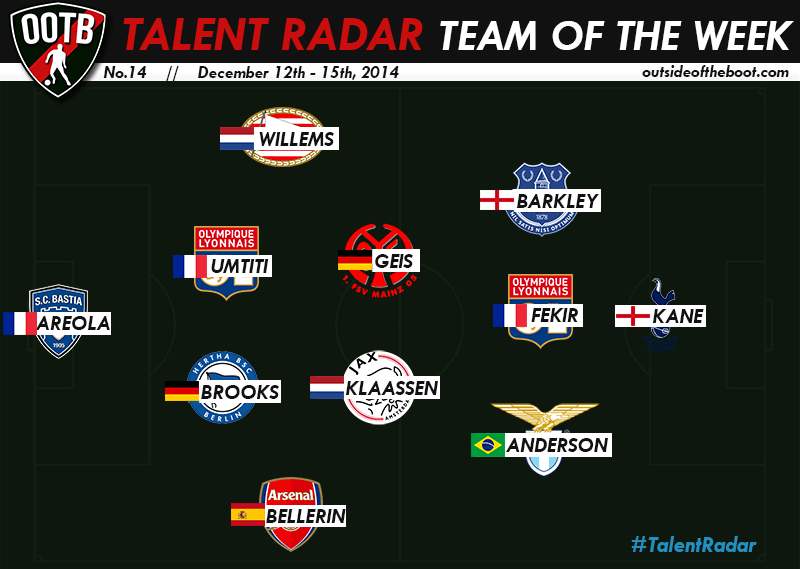 Davy Klaassen was in 10th position in our Talent Radar Top 20 Young Players of 2014 feature. Davy Klaassen | Ajax | Holland | 21| Midfielder: Ajax kept up the pace in their title charge with a 3-1 home win against FC Utrecht with Davy Klaassen once again in the mix of things. In the 18th minute, Klaassen made a run from midfield that was acknowledged by a good ball from Milik (debatable whether it was meant for Klassen). The no. 10 found his way behind the Utrecht defense and one on one with the goalkeeper and proceeded to slip the ball in to the net to double Ajax’s lead. Klassssen put in a well rounded performance, defensively keeping up with 3 blocked passes, a blocked cross and two blocked shots. Ross Barkley | Everton | England | 21 | Attacking Midfielder: Everton faced QPR in a Monday night Premier League fixture at Goodison Park that ended in a 3-1 home win. In what was a breathtaking moment in the 32nd minute, Barkley beat an opposition player with a body feint at the half way line and skipped past another, exploiting his pace. That moment was followed by a quick one two with Lukaku after which Barkley drove in the centre of the field and shot home a thunderbolt with his left foot from about 30 yards out. With 87% pass accuracy and excellent distribution throughout the game, the young England international is clearly making the right noises. Felipe Anderson | Lazio | Brazil | 21 | Attacking Midfielder: Lazio were home to Atalanta this weekend, a game that ended with a 3-0 victory for the Rome based club. The Brazilian showed excellent pace and control driving in on the right side and making this way in to the box before a delightful grounded cross that led to Lazio’s first of the night in the 50th minute. A 58th minute Anderson shot from inside the box whizzed just wide of the far post; the moments prior to the goal quite telling of the youngster’s composure and control inside the box. The Lazio no. 7 provided another assist on the night for Lazio’s second as he danced outside the box with the ball before playing it short to Stehpano Mauri who dispatched it for his second of the night; the Anderson-Mauri combination working once again. This was the youngsters’ first Talent Radar Team of the Week appearance. Nabil Fekir | Lyon | France | 21 | Attacking Midfielder: The youngster was a key element in Lyon’s good performance over the weekend which secured them a 3-0 victory over Caen. The first half saw Fekir on the ball in the penalty area surrounded by multiple defenders before eventually being fouled. The assist went to Fekir as the penalty was put at the back of the net. The second half saw moment where Fekir’s composure on the ball was highlighted: the Frenchman stood in the box once again surrounded by defenders, but picked the right pass to a fellow teammate for Lyon’s third. He did win another penalty after being fouled in the area but failed to convert the chance. With 96% pass accuracy and 5 key passes, Fekir was a stand out performer in the game. Harry Kane | Tottenham Hotspur | England | 21 | Striker: Harry Kane proved to be a crucial element in Spurs’ late victory against the Swans on foreign territory. 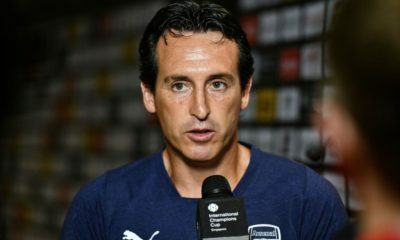 As early as the third minute, the Englishman produced a towering header, getting the better of Swansea defender Angel Rangel and slotting it home from a Christian Eriksen corner. The Eriksen and Kane duo almost produced the visitor’s second goal in the 75th minute from a corner. Kane’s aerial ability proving to be excellent, a point worth noting for the England manager, given their style of play.